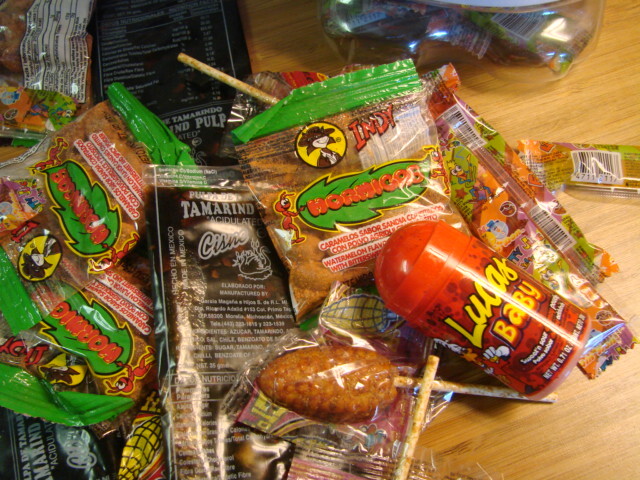 While I was in Lake Havasu City AZ, daughter and I stopped by the new Mexican market, La Carcineria on Lake Havasu Ave. I found the perfect thing for hot chocolate loving BJ. I learned from him it's especially good with a shot of Tequila Rose, mmmmm. 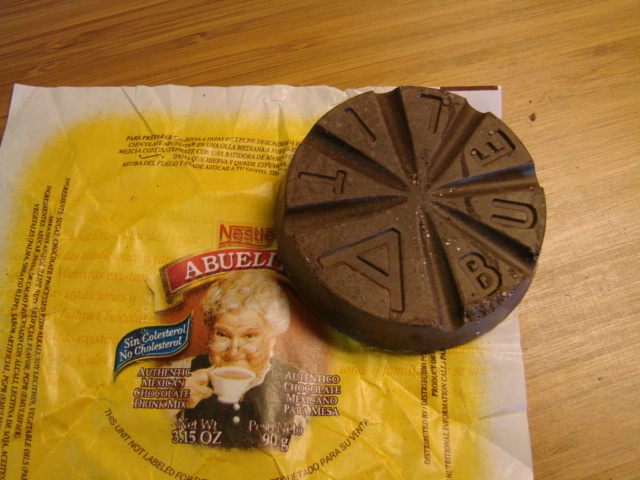 The Mexican style chocolate contains sugar and cinnamon. One of the triangles in a cup of coffee is heavenly. Twirl the molinillo between the palms of your hands to froth the chocolate. 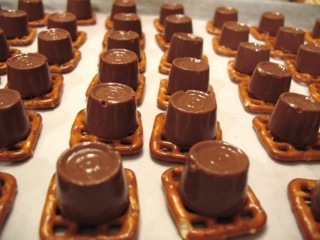 The recipe is 4 cups of skim milk and 1 tablet of chocolate in a medium saucepan over medium-high heat. 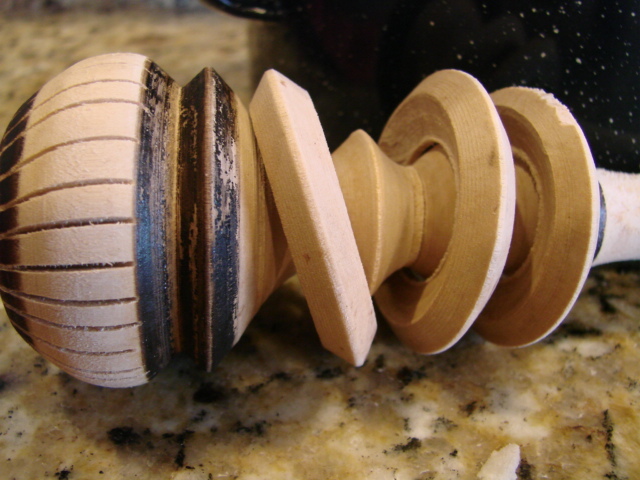 Now here's where the molinillo comes in. 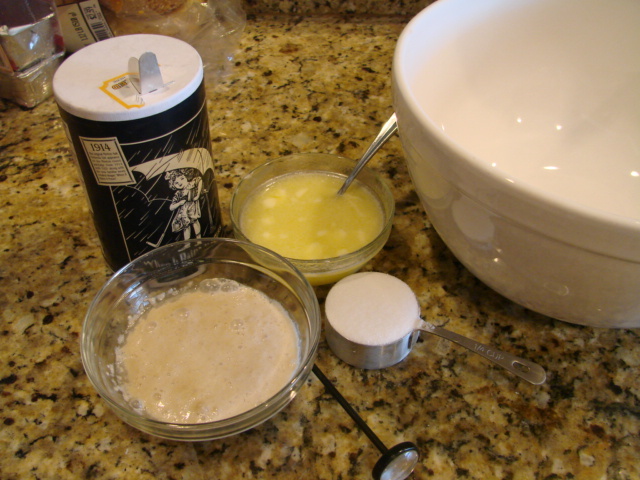 Mix constantly with molinillo, or a wire whisk which is not as much fun, until mixture is frothy and starts to boil. We spent too much time and almost too much money. 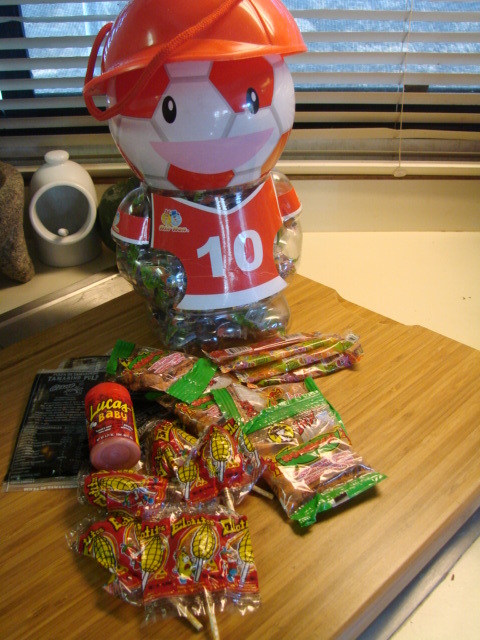 We really zeroed in on the Mexican candy. It was close but I got out with some candy for myself. I took some of my kitchen equipment with me when I visited my daughter over Christmas. 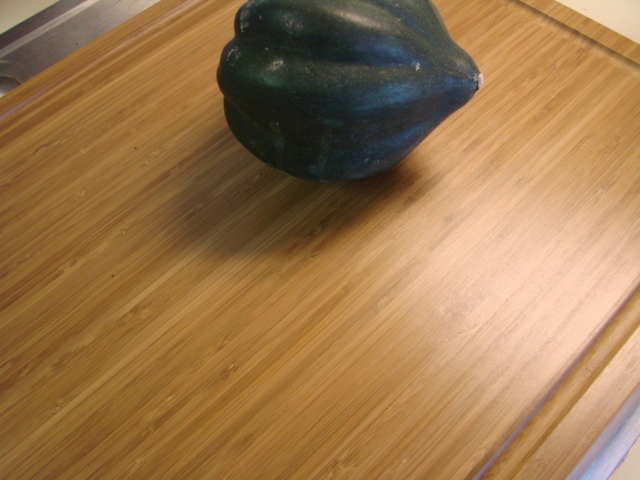 One of them was my good and heavy large cutting board. I use it every day over the kitchen sink for more counter space. I was miles from her house when I realized I left it behind, that and an inexpensive set of ceramic knives. Drat!!!!! I stopped by Linens and Things in Yuma to pick up the knives. They also had some nice looking bamboo cutting boards but they didn't have the size I needed, so I waited to get back to San Diego to get one. I really like it. So far I've only chopped up some vegetables for the vegetable soup I'm making tonight. Got it's first scars :-( It's beautiful, environmentally friendly and light weight. I think I'll go pick up a smaller one also. The grain on it is just beautiful. We had lunch at Jasmine Bistro again. I had some Maguro and Unagi, sorry, I didn't get a photo of them. I was trying to get over the surprise of being served by the owner Dr Chan himself. I remember meeting him a few years ago, I'm sure he was being kind when he said he remembered me also. He asked to take our picture because he's starting a "Who's Who" wall in the restaurant. We aren't "Who's Who's" we are "Who's That's" but we are honored to be one of the firsts to go up on the wall. This of course gave me the opportunity to ask for his picture also. Never miss a photo opportunity. 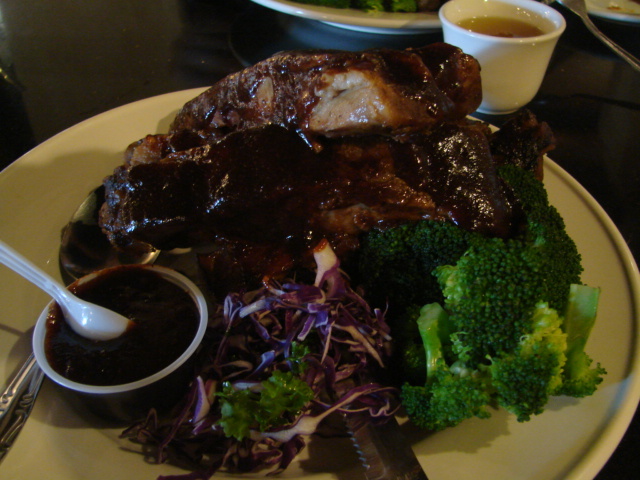 I had the Honey Garlic BBQ Spareribs. They are oven roasted and drizzled with an awesome fusion bbq sauce. 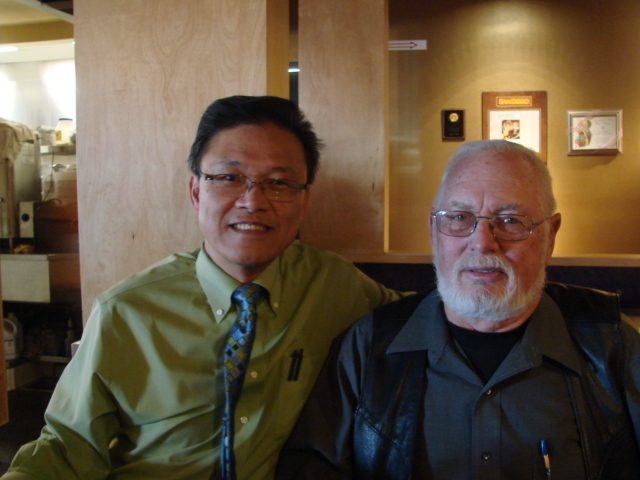 Dr Chan told me that was one of two dishes on the menu that is one of his personal recipes. Stan had the Thai Steak. There is a photo of that in the previous post on Jasmine Bistro. 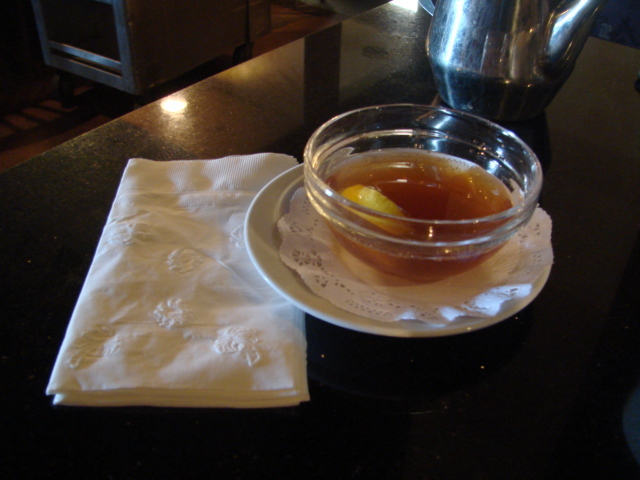 The finger bowl has Jasmine tea and lemon in it. It not only cleans your fingers but takes away any odors. Class act, no little wipes here. Thanks for another great meal, we'll be back soon. 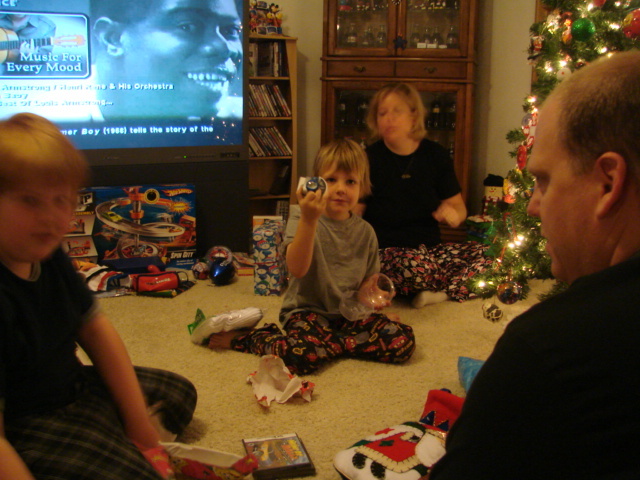 As suspected the boys had a hard time settling down to sleep so Santa could come. They finally got to sleep about 11:30. They must have heard the Reindeer hoofs on the roof because they were up at 12:40 and saw that Santa had come. 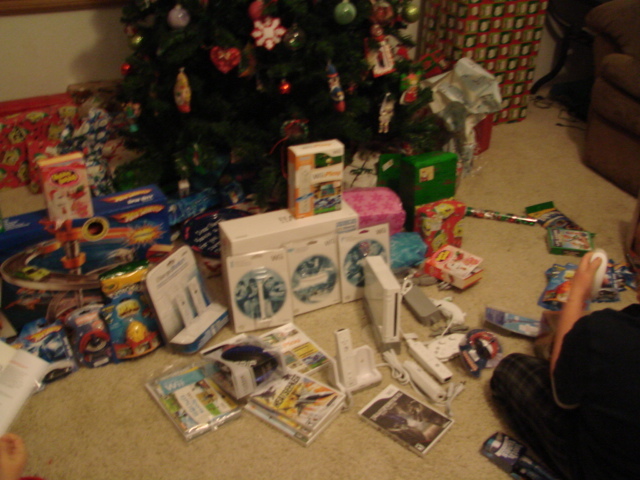 They were allowed to open the gifts from Santa but needed to wait until morning to open the rest. They were too excited to go back to sleep so Erika and BJ put blankets and pillows on the couches for them, and they went back to sleep in the living room. One of the things they asked for were watches. I thought I raised her better, but she hinted she wanted a Floor Mate. 'Twas the day before Christmas and all through the town, we were busy scurrying around. 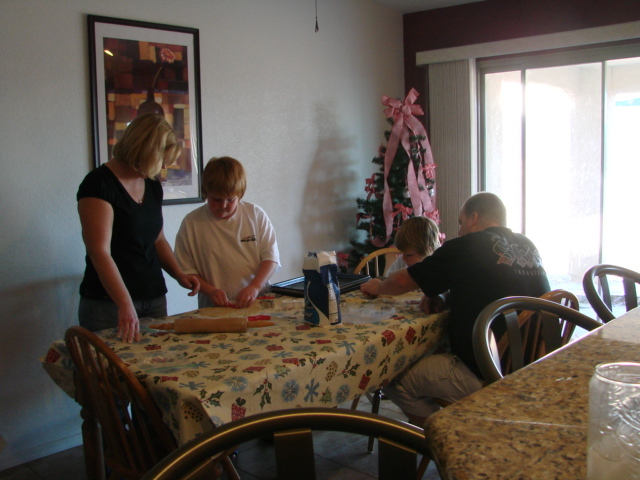 When we finally got back home BJ had the boys surviving in wilderness of the back yard. 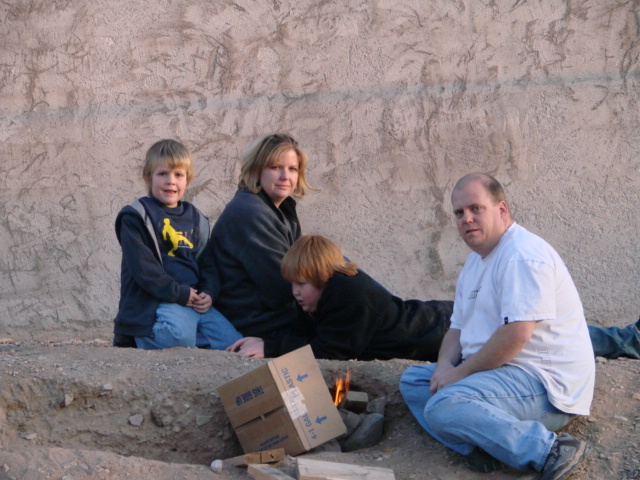 They were to survive by not going back into the house for anything and had built a fire outside to keep warm. Jeremy was in charge of shaving off pieces of kindling from a scrap piece of 2X4. They were so proud of themselves. Mom went out and warmed herself by the fire. 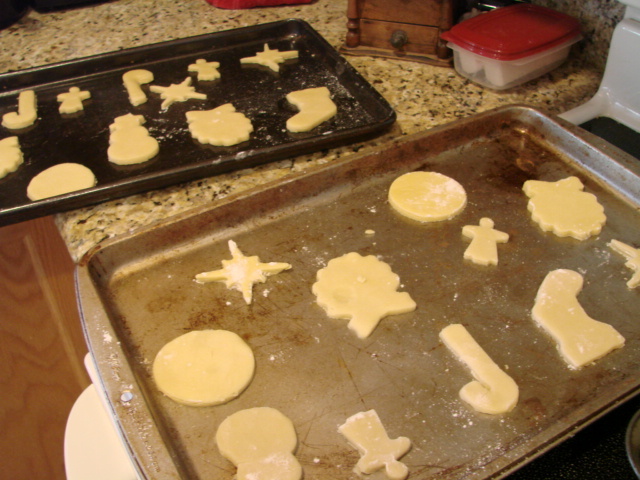 Then it was time to start more cookie baking. 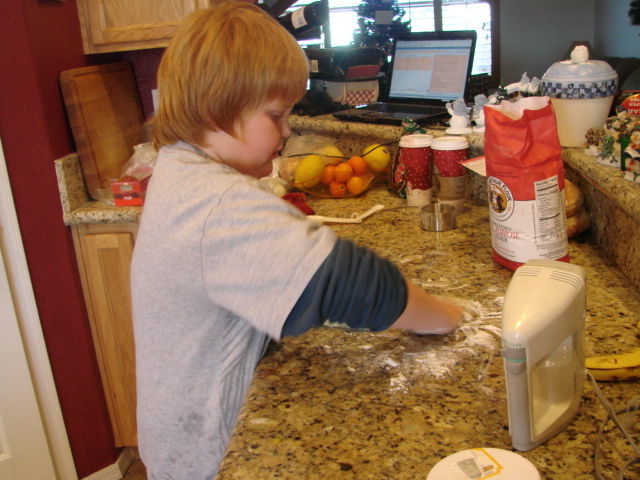 While we were out running some last minute errands, BJ and the boys were nice enough to make the sugar dough so it would be ready for the last batch of cookies. 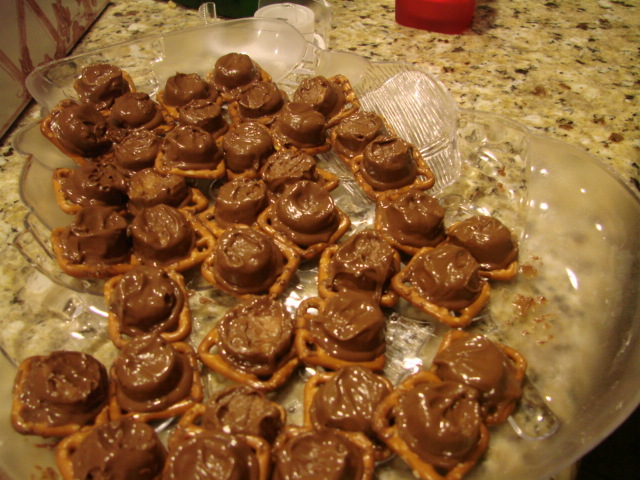 One of the treats I made while I was there, was from a recipe I got from my friend Barb Schaller. I met her through the cooking newsgroup rec.food.cooking. She makes the best little morsels called Turtle Bites. The next three are her photos and instructions. 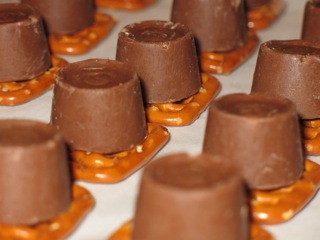 Take Hanover® Butter Snaps Pretzel squares and top each one with a Rolo candy. 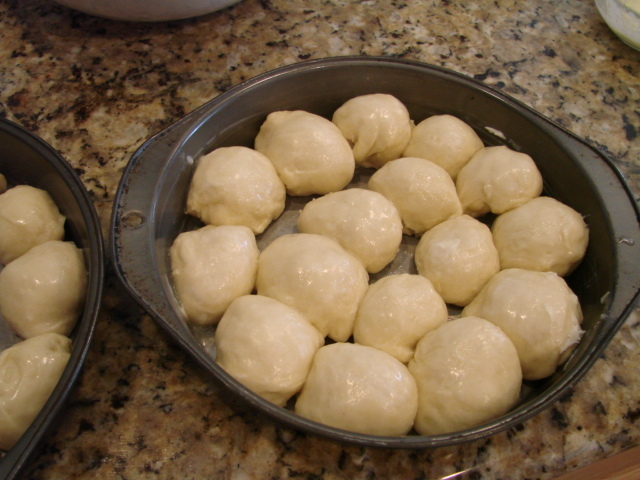 They are then placed in a 350*F oven for 3 minutes, then remove from the oven. 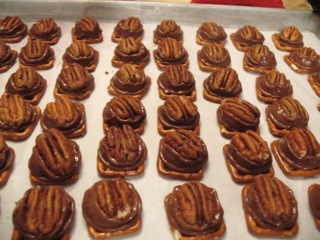 And a pecan is placed on top and gently pushed into the candy. Remember those photos, that's how they are supposed to look. Wellll..... we couldn't use nuts as Jarod is allergic so we put waxed paper on our fingers and gently pushed down on the candy. We got what we thought looked like Reindeer poop, with the pretzel representing the ground. We are all too excited to sleep tonight because we know Santa's on his way. We've been tracking him through Google Earth. The boys have been in bed, not asleep, well one is anyway. 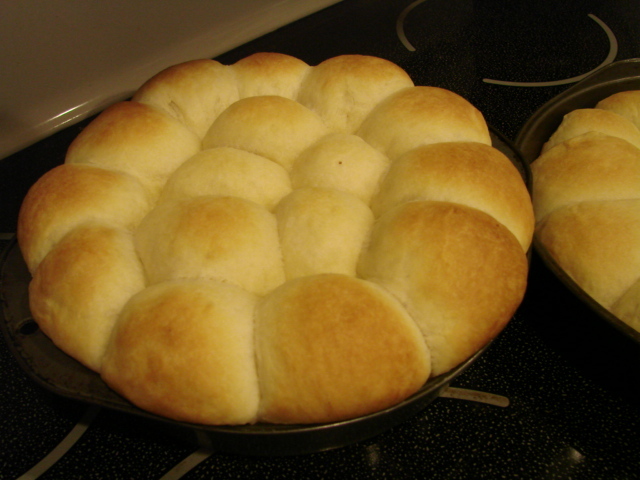 Earlier today Jeremy assisted me in making the rolls for tomorrow's Christmas dinner. 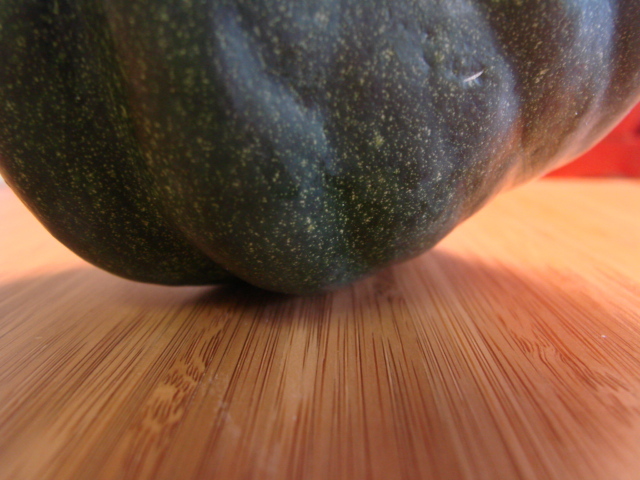 It's a recipe that I gleaned off the food newsgroup rec.food.cooking. This recipe has never failed me. 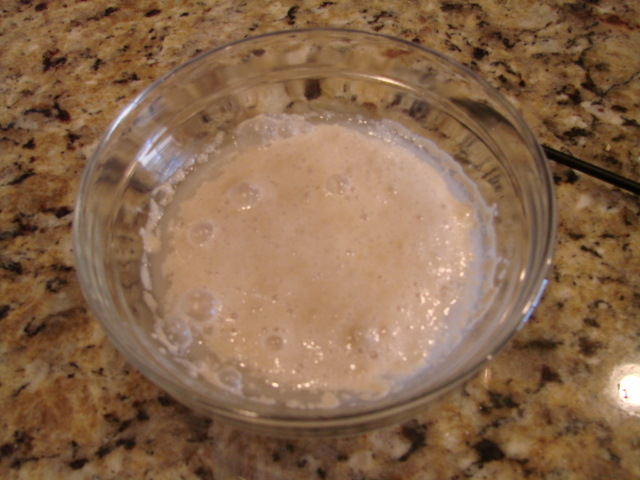 Mix up sugar, salt, butter, the yeast and a beaten egg that I neglected to make sure was in this shot. 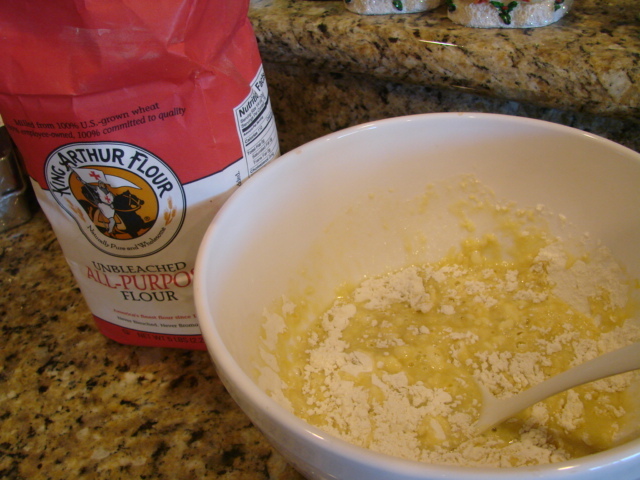 Add 3 cups of flour. 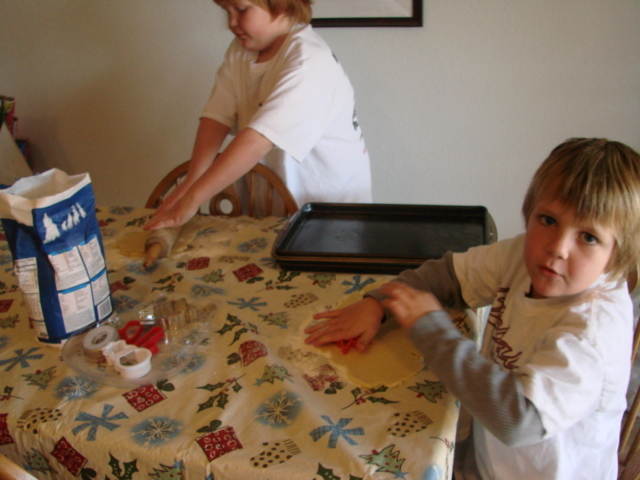 This is a sticky dough and needs to be kneaded for 10 minutes, that's where child labor ahem... I mean a sous chef comes in handy. 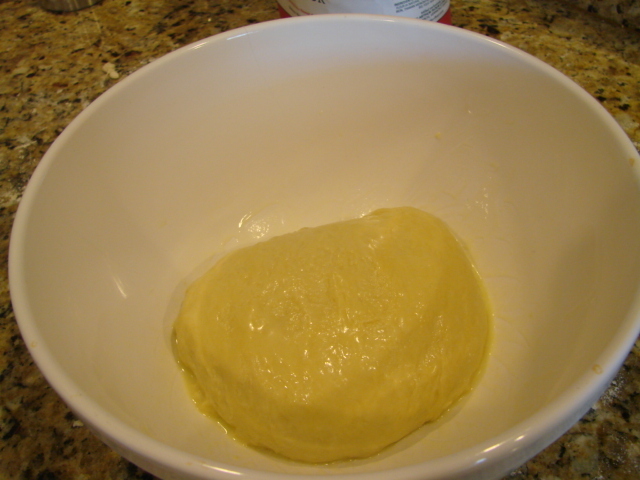 Place in a large buttered bowl and set aside to rise. I'm so mad at myself for punching it down before I got a picture of it risen, it looked so good. 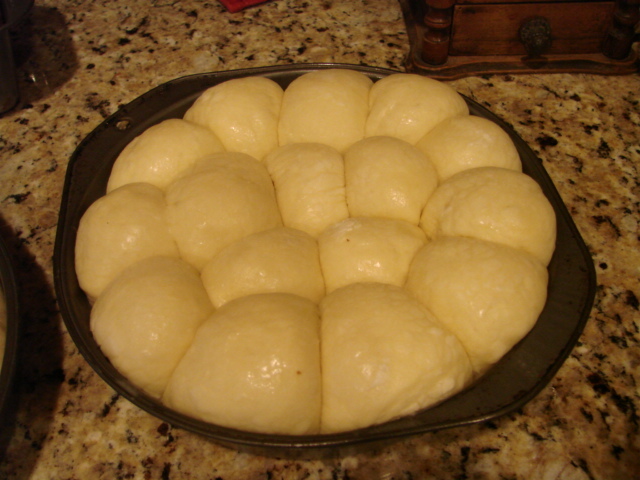 Have your sous chef help you divide the dough into approx 24 rolls and set aside to rise again. 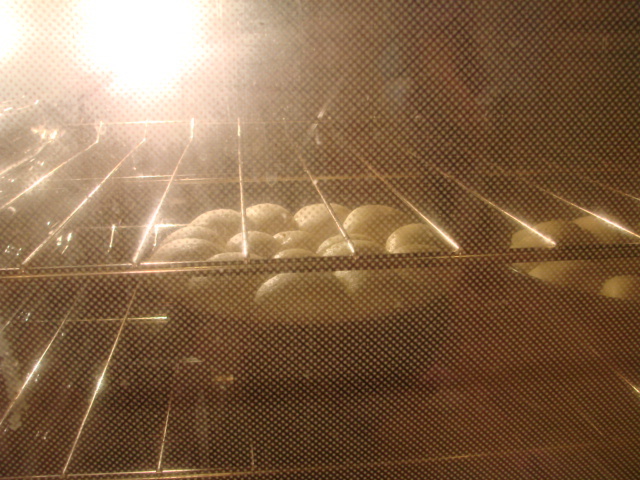 This time I got the shot of them risen. Stick some butter on them, they are so done. I thought I'd better get posting before the days start running into each other. I'm spending Christmas with Daughter Erika and family in Lake Havasu AZ. 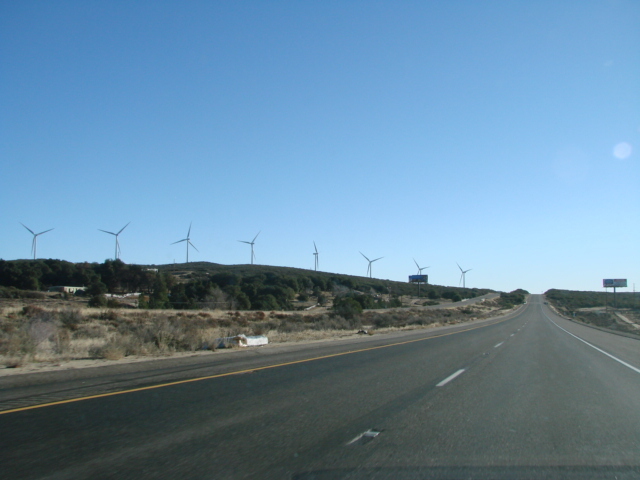 On the trip over I pass the windmills by the Golden Acorn Casino. Don't know why but they fascinate me. I arrived Friday afternoon after a very blustery drive. I brought some grocery items over with me since I'm in charge of Christmas day dinner. 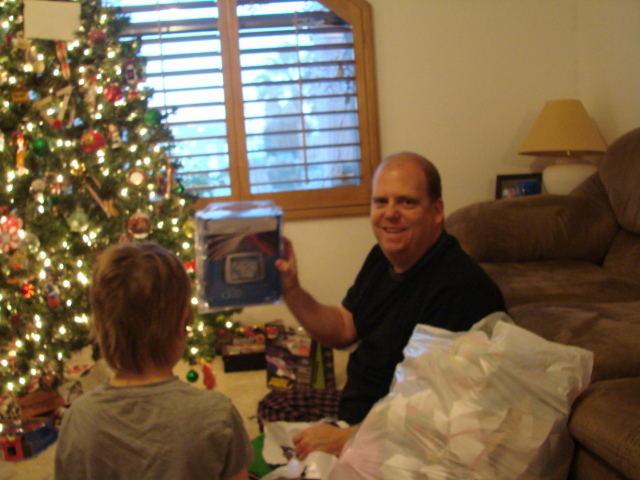 I packaged up some herbs on Dec 12th using my handy dandy Reynolds Handi-Vac. I must say, it really is handy and I'm using it with all I can. I brought one for Erika. 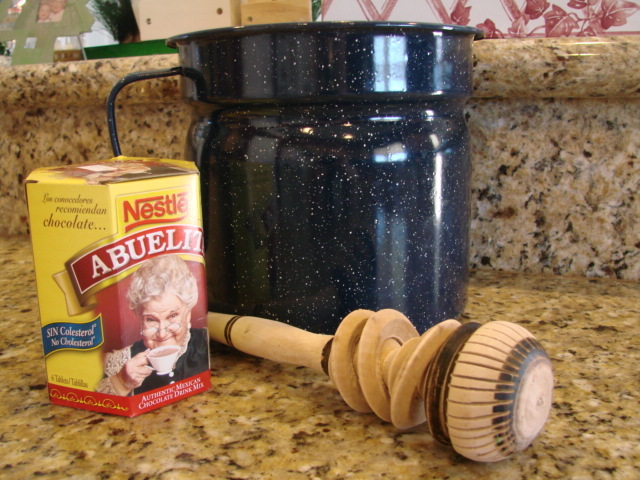 My grandsons use it also, on them selves. They think sucking their faces with it is hysterical. Anyway, I digress. 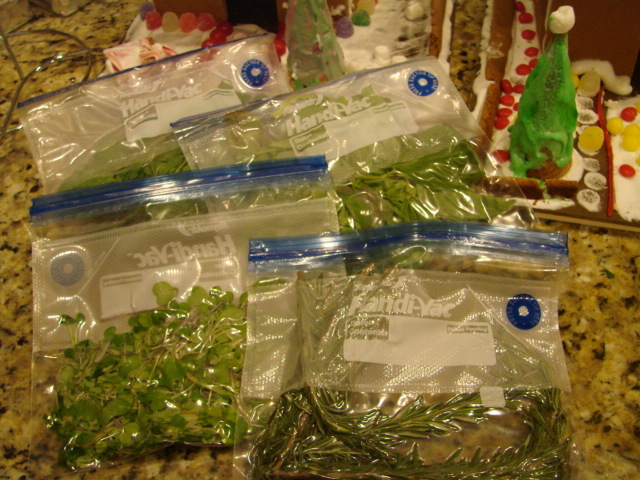 These are the herbs I stored using the handy dandy Handi-Vac on the 12th. 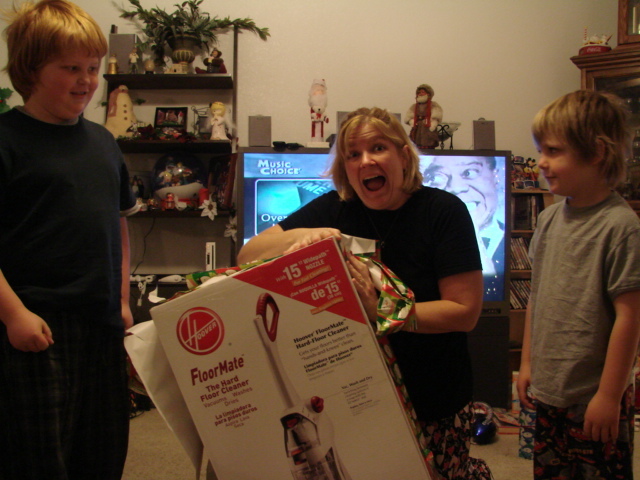 It is now the 23rd, they are still great and I will be able to use them for Christmas dinner. I love my gadgets. After I unpacked my car, and the ice chest, we visited for a little while. 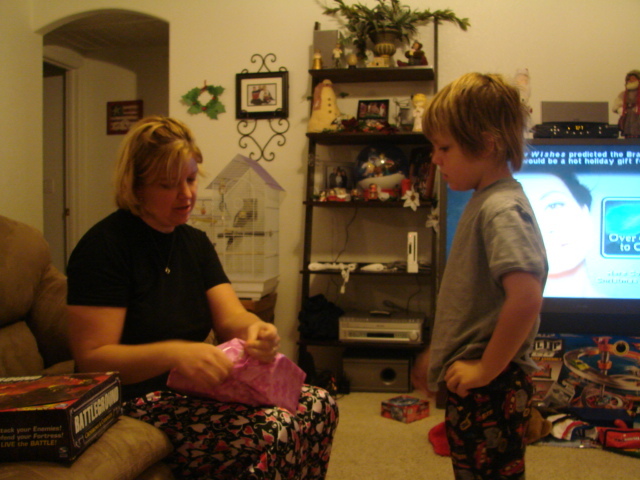 Erika and husband BJ had a little secret shopping to do that night so my grandsons and I chilled out and ate pizza and anti pasta salad from a local brewery-restaurant Mudsharks. I'll have to go try their beer before I leave. 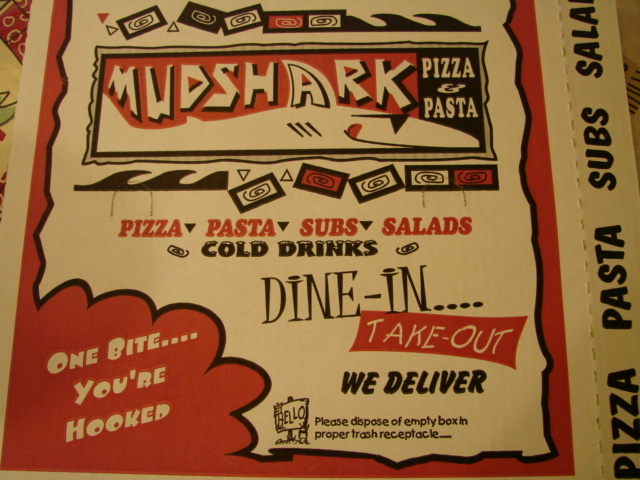 It's got to be better than their pizza and salad. The pizza was a limp greasy mess but the salad was acceptable. I don't think I'm hard to please and I don't expect much from places that will deliver to your home, the convenience alone is worth something, but mercy sakes. 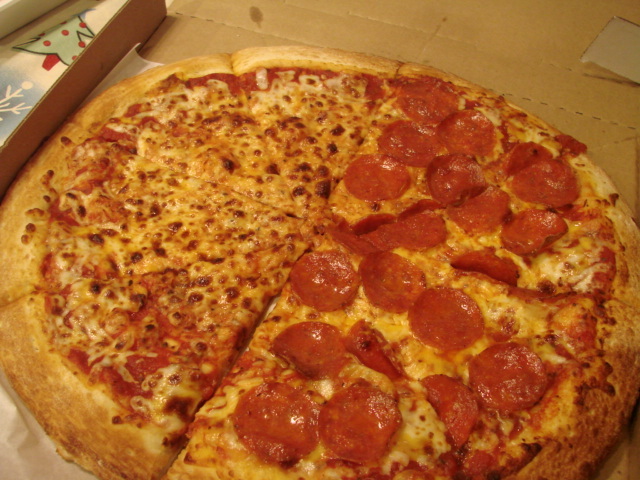 Half cheese, half pepperoni. The delivery man was very nice and polite, most places should have employees like him. 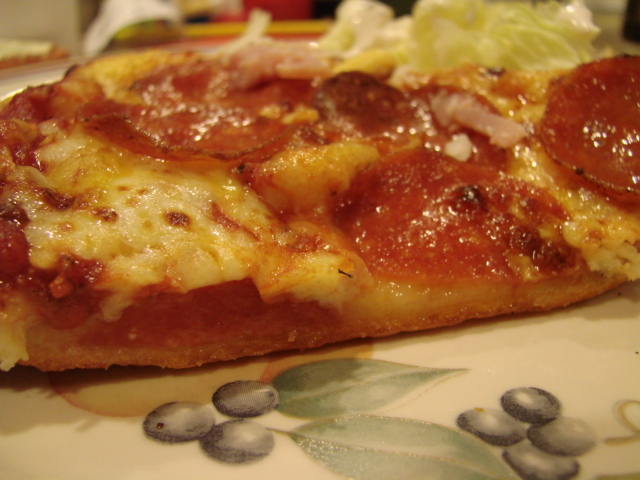 Soggy, greasy slice. I love a bunch of fat on dough as much as the next guy, but having the fat soak into the crust and make it limp is a little much, even for me. 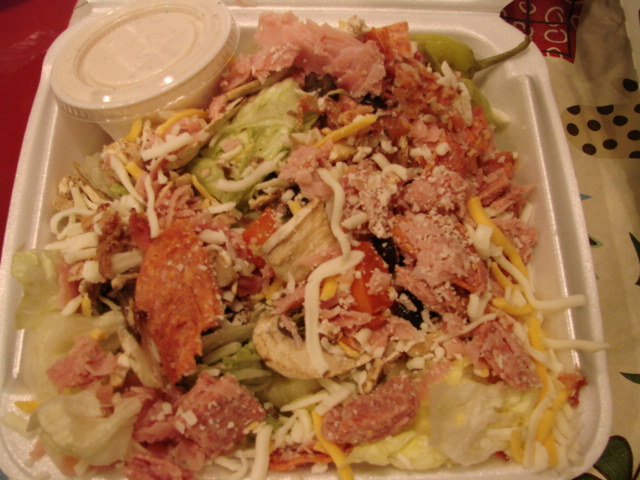 The salad was a generous serving considering it was a half order. It was chock full of meats and cheeses. I ate two big servings. I think I've had my pizza fix for a while. from a terrible cold that hit me like a Mac Truck. I was out like a light for three days then drug myself back to work. My energy level went through the basement and I've only had the energy to do the things I absolutely have to do, not what I love to do, like blogging. I'm on the upward swing now, but Stan came down with my cold a few days ago. I don't know how he got it because it's still hanging out a little with me. Anyway, we are very fortunate that we've already had our flu shots. If we hadn't we're convinced we would have ended up in the hospital with this. Stan stocked up on some soups for me. He bought some of Von's Signature Cafe soups. I wasn't very lucid for a few days but I do remember they were either too salty or to tomato-y. Looking back I think some good ol' canned Campbell's Chicken Noodle soup would have made me feel better, even if only from the childhood comfort food level. 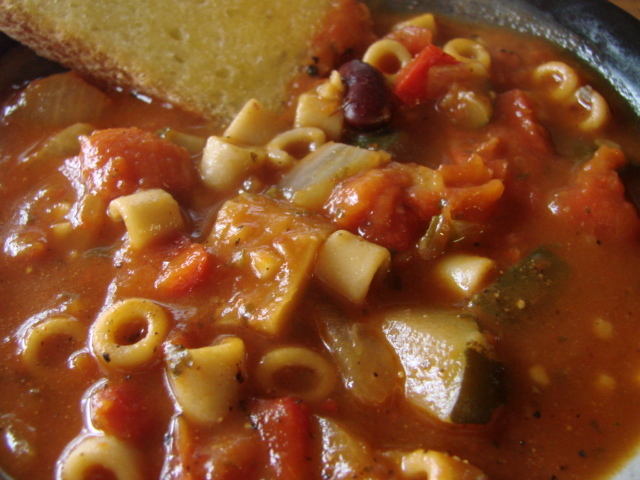 I guess I wasn't too sick to take a picture of the Minestrone soup. It looked better than it tasted. 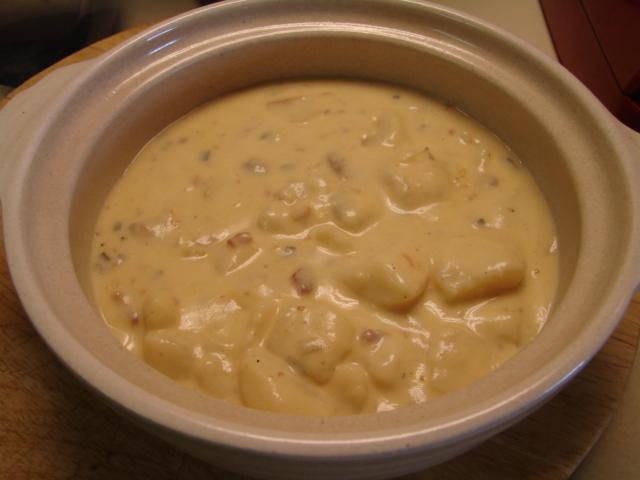 This is the Baked Potato with Bacon soup I heated up for Stan today. This one is our favorite. Heck, what's not to like, you can't go wrong with fat and potatoes.